During our sabbatical year at UCLA, we often went to a restaurant in our street, Beverly Glen Blvd, right at its junction with Mulholland Drive. It was a small Italian restaurant called Fabrocini’s, almost hidden in a little corner, but always packed with folks from the neighborhood. The restaurant is affordable (for L.A. standards, that is), has an extensive menu, and the moment you sit at the table the waiter greets you with a small bowl of their focaccia. Interestingly, each time we went there, the focaccia was just a little different, as if the baker loved to improvise. We were obviously hooked! One evening I was not very hungry and ordered a small bowl of their stracciatella soup for my dinner. From the first spoonful, I was equally hooked. 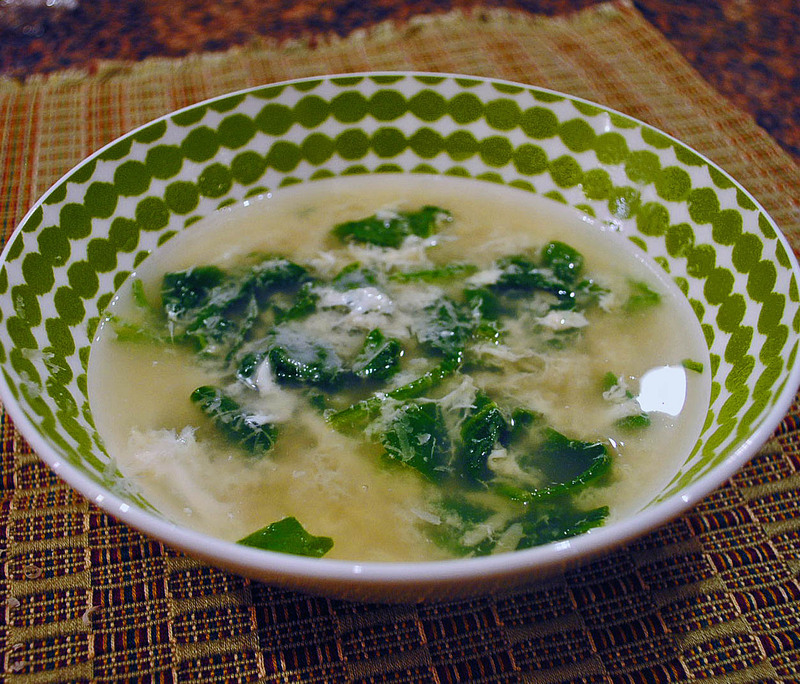 Their version had spinach and a little pasta added to the basic egg-drop preparation, in a light and delicious broth. I loved it so much that before we left L.A. I wrote an email asking for the recipe, but they never even replied to it… 😦 Undeterred, I went on my own quest to make it at home, and finally found a good version on a Food and Wine magazine. Cook the pasta in a pot of boiling salted water until al dente. Drain well. 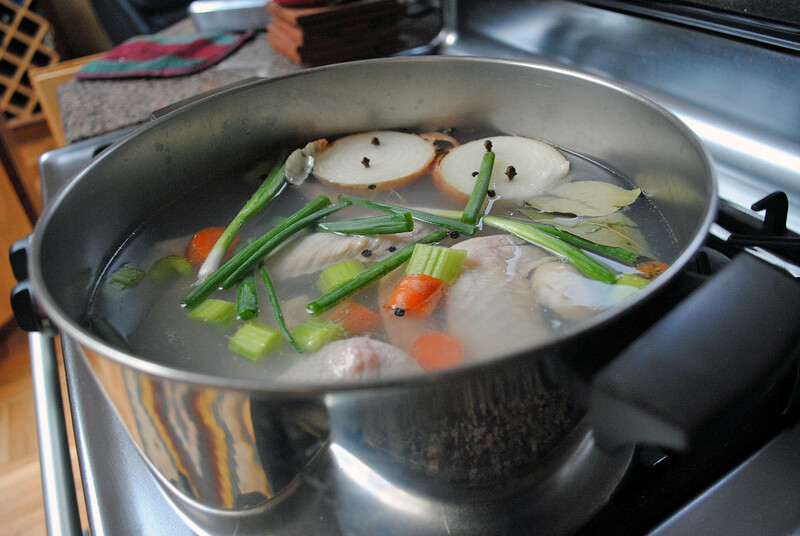 In a saucepan, bring the chicken stock to a simmer with the garlic; simmer for 5 minutes. Remove the garlic using a slotted spoon, add the pasta and spinach and cook over medium heat until the spinach wilts. Season with salt and pepper. Gently stir in the eggs, breaking them into long strands. Simmer the soup until the eggs are just firm, about 1 minute. Stir in the Parmigiano cheese. Ladle the soup into bowls, and serve with additional cheese grated on top. Stuck 2 cloves into each onion half, add all ingredients to a large stock pot, bring to a boil. Reduce the heat to low, and cook, uncovered for 1 hour and 15 minutes. Remove the layer of foam that eventually floats to the surface during the initial stage of cooking, using a slotted spoon. Drain the stock, discard all vegetables and meat. Let it cool slightly, refrigerate, and remove the congealed fat from the surface before using. Freeze 1 or 2 cup aliquots. Season with salt and appropriate spices when using for soups, risottos, or sauces. Almost at the end of cooking…. The reward… Liquid culinary gold! I am no food snob, in the sense that I use store-bought chicken stock on a regular basis. However, for this soup to be really special, I went the extra mile and made my own. 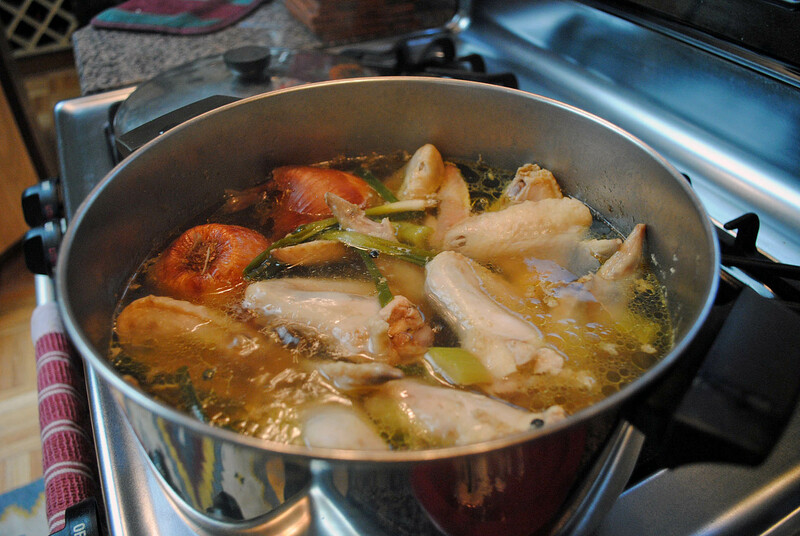 I’ve made many types of chicken stock in the past, using chicken bones, or a whole chicken. But once I found this shortcut version at Bittman’s book “From Simple to Spectacular,” I adapted it to my taste and it’s been my method of choice because it is fast and produces incredibly rich and dense stock. Usually I make my first batch when the weather turns cold, and save a few cups in the freezer. I’ve made a version of this soup many times, and it always hits the spot. Thanks for the reminder. Like you, I often make my own chicken stock, but like you, I often don’t have time or don’t plan ahead to take some out of the freezer. Which store-bought stock/broth do you like? The least offensive, I think, is Kitchen Basics, but I’ve never found one that really tastes home-made. I use Swanson’s, but not their organic version that for some reason I don’t like that much, I prefer the “regular” . They recently launched this new product, small pouches with a concentrated stock that makes about 1 cup – it’s not bad, but as you say, no commercial product matches the taste of a homemade broth…. A recipe with “one hour” in the title, which makes something I associate with an hours-long process, becomes quite attractive. The stock recipe alone is wonderful, and the soup sounds delightful. Thanks for this one, Sally! plus, it’s a hands-free hour, not bad at all, to have a nice stock ready to use, waiting for you in the freezer. Sally, re “cup pound” of ditalini-which is it? One cup or 1 pound. I think it is one cup, correct. I could live on soup and foccacia any day!! I love little places like that. This is a great soup, it brings back a lot of memories when my mom used to make it. What a lovely recipe! I too put ginger in my stock (star anise too). Thank you so much for sharing, Sally. I’ll make this as soon as we get back home. star anise will be on my next batch, I think it’s a great addition together with the ginger. I also sometimes finish it off with a little lemon juice, but normally I store it without it, and may add when I’m incorporating on a dish, if the flavor of lemon goes well with it. Did you send a letter to the LA Times asking for it? I bet they could get it. They do that every week. Anyway, I can see why you love this. No, I did not… Maybe I should – in fact, we will be back in LA in a couple of weeks, it will give me the chance to taste it again. I really enjoy egg in soup – such a nice texture and satisfying too. Love discovering unpretentious restaurants like that, full of friendly service and home-style food. I’m glad you were undeterred and tracked down this wonderful version. I need to start making more homemade chicken stock! Will be paying attention to your blog post! Spinach is always showing up at our table. The funny thing is that I used to hate it while growing up, but I hated soooo many things… my poor Mom, how could she stand me? That’s a mystery. You may know this, but traditionally escarole is used in all sorts of Italian soups. It’s delicious cooked on its own, too. Very Italian, of course. I’ve long thought that homemade stock is what separates the men and women from the boys and girls. I suppose that makes me a bit of a snob but the results are so much better in any dish that relies heavily on a stock (such as a soup like the stracciatella). This is a wonderful old world soup that my hubby’s family taught me to make many years ago. 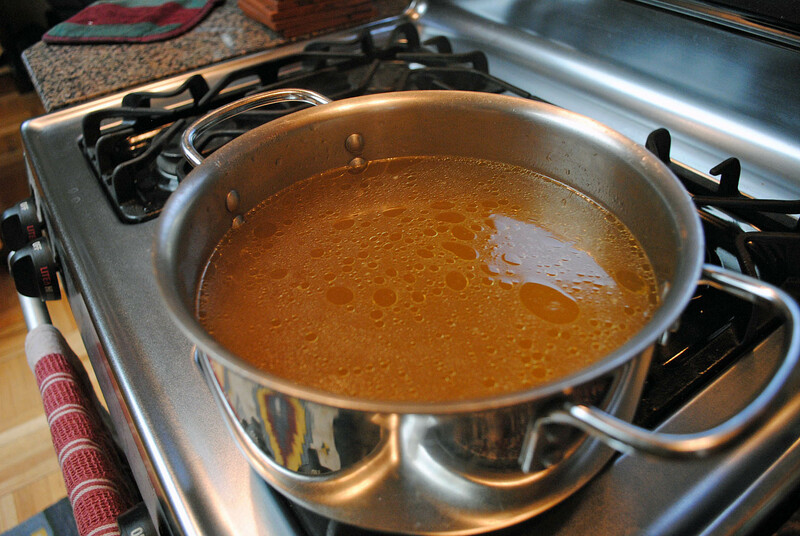 You can also make a quick version with canned broth, but of course homemade stock is always better.